I’m a big fan of garlic in my food…but I’m very self-conscious of my breath after. You know what I’m talking about, right? Stinky! I avoided it as much as I could back in my single days. But, despite this common perception, it’s just been found that the smell of garlic could actually give a boost to your love life! Yes; garlic is often associated with bad breath and foul bodily odor, but a new study out of Scotland and Prague suggests that women are actually more attracted to the body odor of men who eat large amounts of garlic. 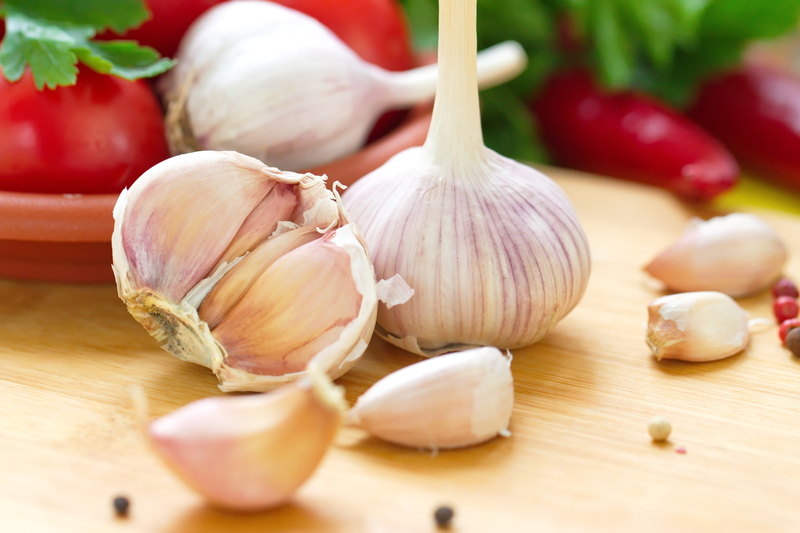 Could garlic actually be an overlooked food aphrodisiac? Garlic has many health benefits. It has antifungal, antiviral, and antioxidant properties, and it has been linked to reducing inflammation, fighting off colds, and even preventing cancer. Now, to add to garlic’s impressive roster of health offerings, this new study suggests that it can also help increase sexual attractiveness in men. The study, done by researchers at University of Stirling in Scotland and Charles University in Prague, had 42 men eat raw garlic, take garlic capsules, or eat no garlic with a meal of bread and cheese. For 12 hours after eating, the men wore pads underneath their armpits to collect sweat. You can guess what they did next. The researchers then had 82 women smell the sweat samples and rate them based on how pleasant, attractive, masculine, and strong the odors were. The effect of the garlic did not change whether it was eaten raw or in capsule form. However, only eating a large amount of garlic produced a body odor that women found attractive. For men who ate six grams of garlic, which is equal to two cloves, women did not note any difference in body odor. However, when men ate 12 grams of garlic, women rated their body odor as more attractive than men who hadn’t eaten any. How Does Garlic Make Men More Appealing? While garlic does cause bad breath, due to gases which emit sulphur, the researchers suggested that these bad-smelling compounds likely do not reach the skin. Most of them are likely released through the mouth. “Our results indicate that garlic consumption may have positive effects on the pleasure derived from perceived body odor perhaps due to its health effects,” said Craig Roberts, a co-author on the study and a psychology professor at University of Stirling. So, since people are often attracted to healthier mates, garlic may make people smell more attractive by reducing microbes, bacteria, viruses, and other indicators of poor health in sweat. The researchers suggested that it’s also possible people simply evolved to prefer the smell garlic produces in sweat, due to its healthy properties. This means you should pile on that garlic without worrying about its effect on your love life; not only is garlic healthy (and tasty! ), but it could also make you smell more appealing, too…but maybe just pop a breath mint or two after! “Research finds men who eat garlic smell more attractive,” Medical Xpress, November 13, 2015, http://medicalxpress.com/news/2015-11-men-garlic.html. Freeman, Sophie, “Forget aftershave, if you want to charm the ladies, eat GARLIC: Women find the smell of sweat more attractive after eating the bulbs,” November 11, 2015, http://www.dailymail.co.uk/sciencetech/article-3313356/Forget-aftershave-want-charm-ladies-eat-GARLIC-Women-smell-sweat-attractive-eating-bulbs.html.